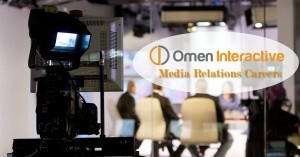 Omen Interactive is a fast-growing digital marketing agency headquartered in Sarasota, FL. We currently have an opportunity for a capable media relations/PR specialist to join our cutting edge digital marketing team. The Media Relations Specialist is a core part of our team. She/he will execute on media relations strategy for assigned client(s), provide media analysis and counsel to clients. This requires excellent 1-on-1 communication skills as well as being friendly, helpful and personable to media and our clients. Specific tasks include: developing and maintaining relationships with clients and members of the news media, executing on media pitches, executing on PR plans, following up with press releases, award nominations and other related materials, attending media interviews, developing message points, press kits and fact sheets. Education: Degree in public relations or communications preferred. Required experience: Two years experience without a communications or public relations degree, otherwise newly minted communications and/or public relations are welcome to apply. To apply please fill out the form below and we will contact you.